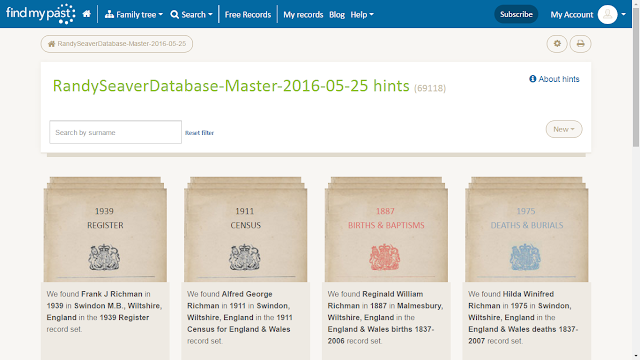 I submitted a new GEDCOM file to Findmypast back in May 2016, and it was uploaded to their family tree system. 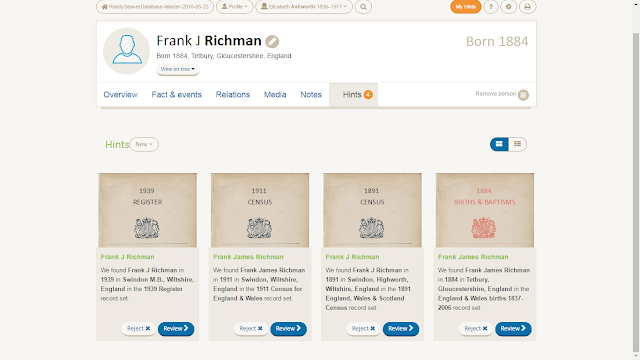 It had over 46,000 persons in it, most of them born in the USA, but some are from England and other countries. 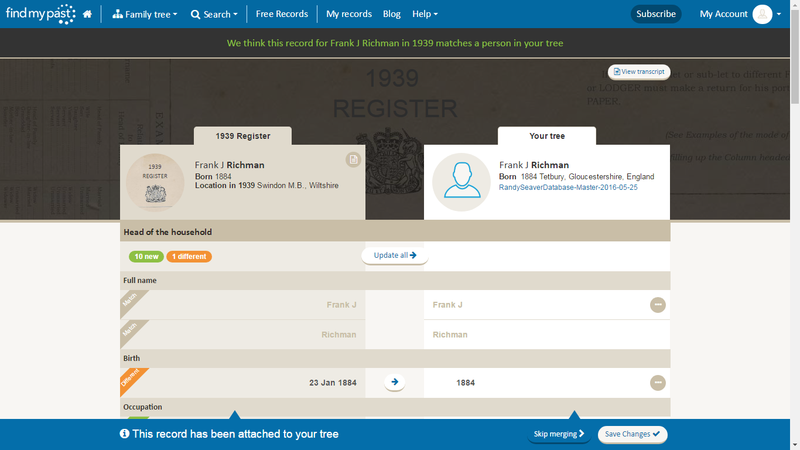 It took some time for my Record Hints to show up on my Findmypast tree, but I now have 69,118 Hints to deal with. 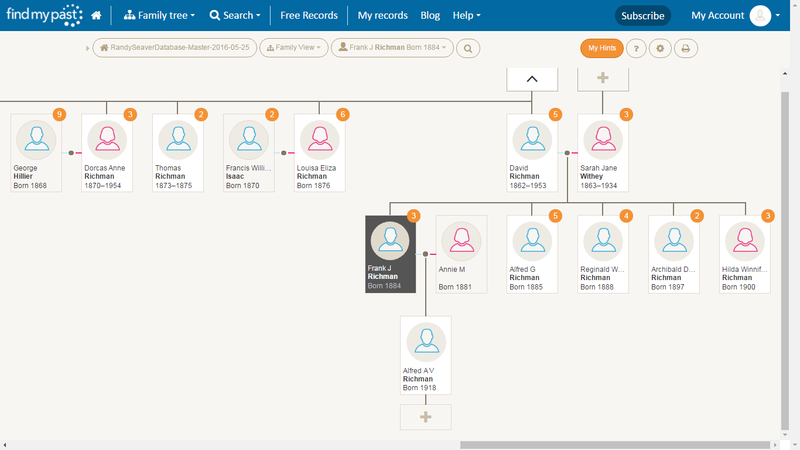 After extensive review, I have found that the Findmypast Hints for almost all of my American ancestral families are from records that I already have found from years of research on Ancestry.com and FamilySearch, but many of the Hints for my English-born ancestral families are new to me. I've chosen to "mine" these Findmypast Hints for my English ancestral families from the 19th century. In many cases, they are 5th cousins or closer, so I may have some of their descendants show up as a DNA Match on one or more of the DNA test and analysis services. Consequently, I want to extend these families into the 20th century if I can. All of the Hints, seemingly in a random list of hints for all of the individuals in my tree, are shown on the screen above. I can scroll down and find more if I care to - probably all 69,000 of them. I judged that was probably a waste of time! There are four Hints for my cousin, Frank - the 1939 Register, the 1911 Census, the 1901 Census and an 1884 Birth or baptism record. If these are for the right person, I want to add this information, and in the process I may find descendants. 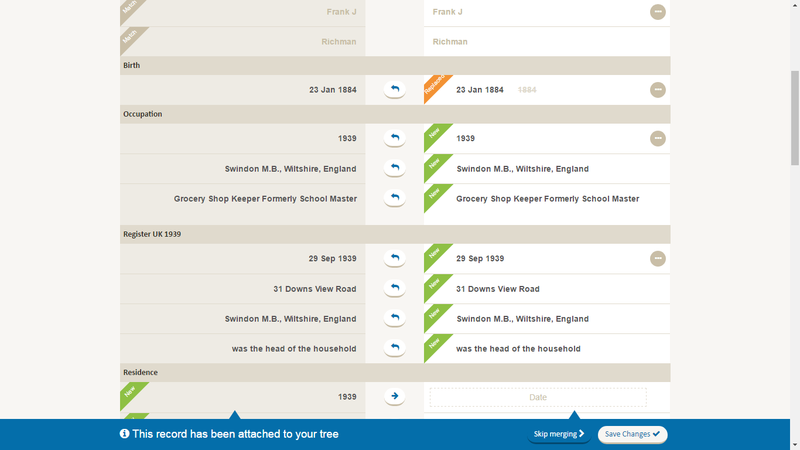 At the top of this page is the person's name and information from the record (the 1939 Register) and from my FMP tree. This looks like it's the same person to me. 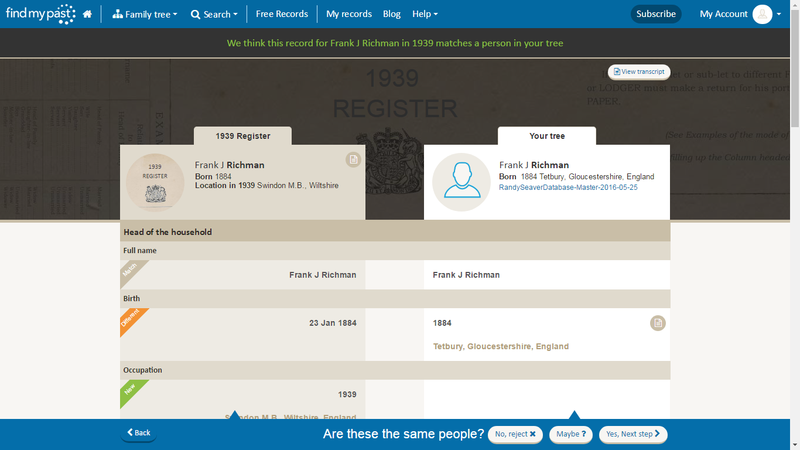 At the bottom of the page above, the question in white on blue is "Are these the same people?" I think so, so I'm going to click on the button for "Yes, next step." 5) I clicked on the "Save changes" button at the bottom of the screen above. I could have chosen to "Skip merging" and gone back to the list of Hints if this record did not apply to the FMP tree person. 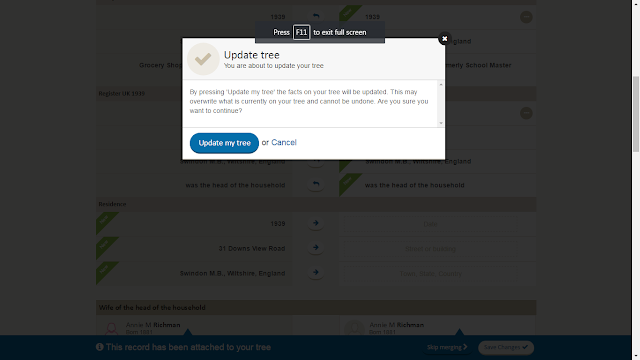 A "last chance" screen appeared saying "Update tree, you are about to update your tree." 7) There are three more Hints for cousin Frank that I need to review and accept - perhaps he and Mary had more children than Alfred born in 1918 - the 1901 and 1911 census records may provide their names Or not! Perhaps those children have families who are my cousins also!